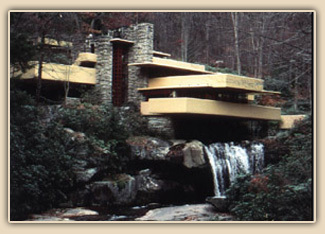 Designed in 1935 and completed in 1939, Fallingwater is recognized as one of the most important examples of 20th century architecture in the world. Frank Lloyd Wright originally designed the sprawling house built on top of a waterfall for Edgar J. Kaufmann, a Pittsburgh department store owner. The house was used as a family retreat for over 25 years before it was turned over to its current owner, the Western Pennsylvania Conservancy. Frank S. Welsh was asked to microanalyze and evaluate 20 carefully selected samples from the interior and exterior in 1989 and 1990 to determine the original paint colors and their composition. 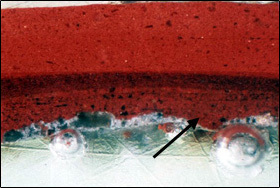 Using microscopical and X-ray diffraction analyses, we confirmed that Wright used only 2 colors throughout the house. A moderate reddish brown, also known as Cherokee Red, was painted on all metal surfaces, and a light yellowish brown cementitious paint known as "Cemelith" was applied on all of the masonry walls both inside and outside. 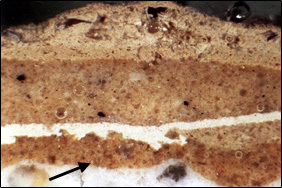 Crossectional photomicrographs of paint samples from: (left) a metal window with the original Cherokee Red paint (arrow) below many later layers of reds; and (right) an interior plaster wall exhibiting the original light yellowish brown Cemelith paint (arrow).